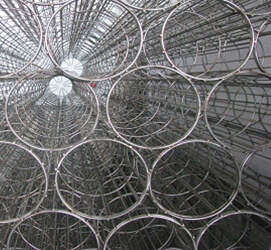 As DTI ,we are producing cages with jetpulse type and flat type for every sizes either one piece or double piece.Wire cages are cleaned from the chips after the production process therefore the possibility of tearing and deformation is minimised while the filter bags are put in and taken out of the baghouse.The life of wire cages is prolonged by delaying metallic corrosion with electrogalvanizing. Our company targets to be the leader in the sector with its investments focusing on producing filter bags,wire cages and venturi used in dust collecting systems.We submit customers the products of high quality with low price with its young and dynamic staff.Our objective is zero mistake and maximum customer satisfaction. Our target with new formation and projects is to contribute to emerging competitive supplier market for you respectable customers to standardize the delivery of the products of high quality on time and the solution for your every kind of problems with our wide knowledge instantly.The manufacturing of filter cages and the other equipments is carried out in our plant. *These equipments can be selected according to the special needs as well as the technical specifications of their producer.